We've all been there, you finish after a long day of painting and look down at your rollers covered in paint. The last thing you want to be doing is spending hours cleaning the roller sleeves. I have compiled 3 effective ways of cleaning your roller sleeves so they are ready to go for your next job. 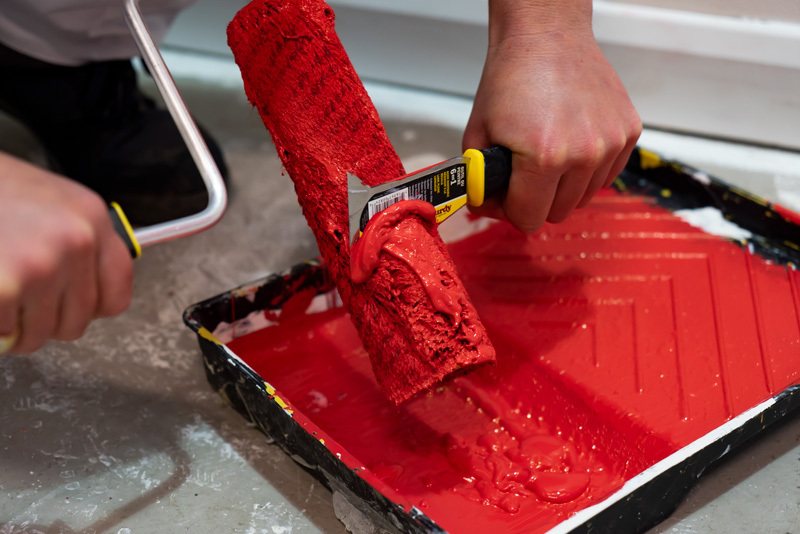 All of these methods are suited to rollers that have been used with water-based paints. Some of these methods can also be used with oil-based paints but I recommend using solvents to help with the cleaning of these as warm water and oil based paints don't mix well and you could end up in a real mess. The first method uses good old elbow grease. Before you start by scraping excess paint off the roller sleeve using a scraper. Something like the Purdy 6-in-1 multi-tool will work best, this will help to reduce the amount of paint on the roller. Once you've finished scraping, remove the roller sleeve from the frame as soon as possible before the paint dries. Take the roller to the sink or a bucket and fill it with warm soapy water. Ideally, you will be next to a clean, running water source so you can rinse the rollers. Use the soapy water to wash the rollers, regularly remove the roller and run it under the clean water to clear the paint filled water. I don't recommend leaving the sleeves to soak in the in the soapy water as this can affect the roller material and could reduce the life of the sleeve. Once the water held in the sleeve starts to run clear your roller is clean. The next method is one that needs a disclaimer as it isn't one that I would necessarily recommend as it could damage expensive equipment but I felt leaving it out might not be fair as it is used by a number of professional decorators. Once you've scraped the majority of excess paint out the roller sleeve, remove it from the roller cage and put the roller sleeves into a washing machine on a cool wash. Once they are finished you can take them out and use a roller spinner to dry them out or just leave them to dry naturally. Beware though, firstly this could cause damage to your nice expensive washing machine which your better half may not be happy about. Secondly, this method could reduce the life of your roller as it is quite a harsh way of washing a roller sleeve. As with most things, there is always a tool device will do the job for you. It is possible to buy roller cleaners that allow you to put the roller inside a plastic tube that has the other end connected to a hosepipe. This then forces water into the roller sleeve to push the paint out of the roller and out of the other end of the device. These can be effective and can save some time but you will probably end up giving it a final wash with warm water after to get it completely clean. Once your rollers are clean it is time to dry them. Resist the temptation to stand them on their end or lay them on the nap. Also, please resist the urge to lay them on a radiator as this will make them go hard making them unusable next time. The best way to dry roller sleeves is naturally, hang them with a piece of string between two points and threaded through the middle of the sleeve. So now you have seen some options for cleaning your roller sleeves the choice is yours. You may even hear of other ways to clean your rollers but choose the method that suits you best. Good quality roller sleeves that are looked after well can have a really good life span and will give a great finish time and time again.